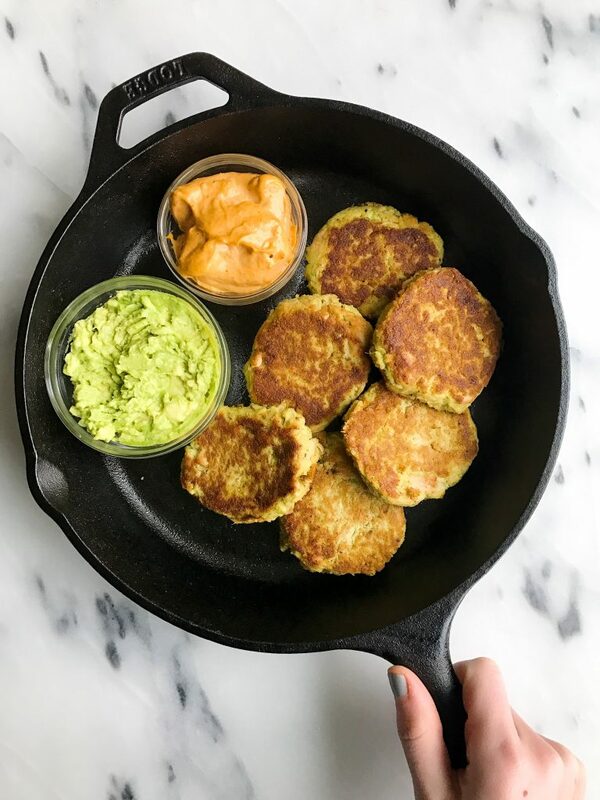 4-ingredient Tuna Avocado Cakes for an easy and delicious Whole30 recipe! Lunch. Oh lunch. I personally can eat the same thing every single day and be happy. Jord on the other hand gets quite bored, quite easily and cannot. To be honest I am pretty envious of that because eating the same thing everyday isn’t exactly good for us (well at least females). I have been reading a ton about female hormones thanks to Alisa Vitti’s book Woman Code, and my life has officially change. More to come there, but she has taught me the importance of switching up your foods a bit each week. Jord absolutely loves taking tuna salad though a couple days a week. At first I was so against canned tuna because the mercury levels but when I learned that Safe Catch is super low in mercury (lowest out of any brand), we started to stock up. Then I told my mom and brother who love tuna and now they can’t stop eating Safe Catch. Safe Catch also saved my sanity during J’s Whole30 because their tuna is Whole30-approved. Tuna is so underrated though if you ask me. There is so much you can do with a can of tuna. 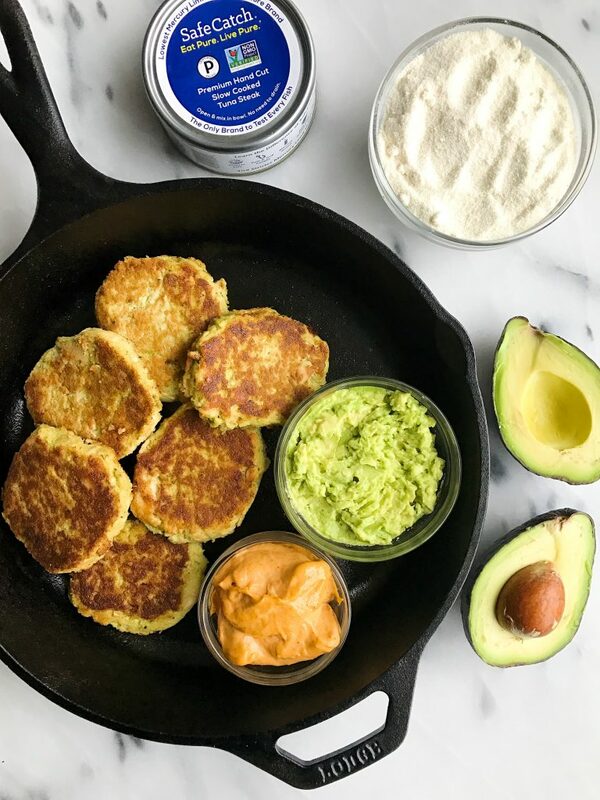 These 4-ingredient Avocado Tuna Cakes are our latest fav. Now I only will eat or buy Safe Catch tuna. The do tuna differently. It is all hand cut and packed premium tuna steaks, slow cooked to perfection and all the omega3 oils and nutrients are still there unlike most cans of tuna. It is also certified paleo and non-GMO. 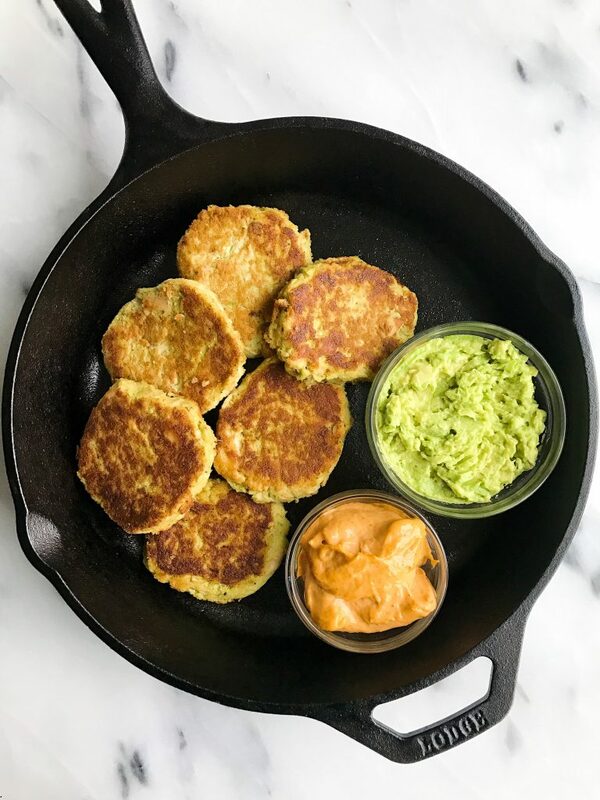 These Avocado Tuna Cakes are amazing on top of a salad, your favorite grain, anything. They are so easy to make and so so flavorful. When you are done eating them, try those Sushi Tuna Stacks and Spicy Thai Tuna Burgers too. After making the patties, do not skip the step of refrigerating the cakes before cooking, it is key! Enjoy! I loved these on top of a grain bowl or salad with some veggies and a light dressing! I could pretty much eat the same thing every lunch time too; it sounds like Safe Catch is a really good option! They’re my go-to easy lunch recipe. So simple, easy to make and delicious. I substituted almond flour for rice flour (it’s all I had) and it worked well! What is that yummy looking orange sauce you have sitting in the picture? These look amazing, but tuna always tends to dry my mouth out. I bet having some kind of sauce to go with these would help with that! What about the green sauce on the side? Does this recipe call for two cans or four (5oz.) cans of tuna? Do you think chicken salad would substitute well for tuna? absolutely! i haven’t tried but i don’t see why not. First time on your page and I just tried this recipe and it’s a keeper for me! I will eat this even when I’m not on a Whole30 journey. I added some fresh green onions to the mix, just because I had them on hand and they needed used.